Next review Empire Today - Poor installation and customer service!! Your satisfaction is important to us, and we’re disappointed to hear about the delays in your installation. We’ll be in contact with you shortly to learn more and start working towards a solution. The poorest service I ever encountered. 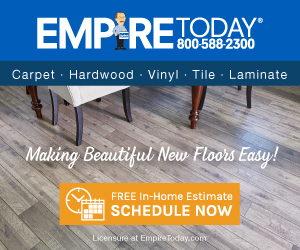 It took almost a week for my installation to be done because Empire Today didnt have the carpet on my scheduled date Tuesday. Pushed the date two days out Thursday and no carpet. Pushed another two days Saturday and finally got carpet installed. I called empire before my installion to work out a discount and was told to call after the installation was completed to take care of it. After the installation, I proceeded to call and spoke to the installers mgr. and agreed to pay half the amount of the original quote for services and installation. Now I'm getting notices for the balance owed or will go to collections. For the 3 days I missed from work is far more than the $200 discount which empire is offering. UNACCEPTABLE! Review #990135 is a subjective opinion of Chrisfernandezjr.